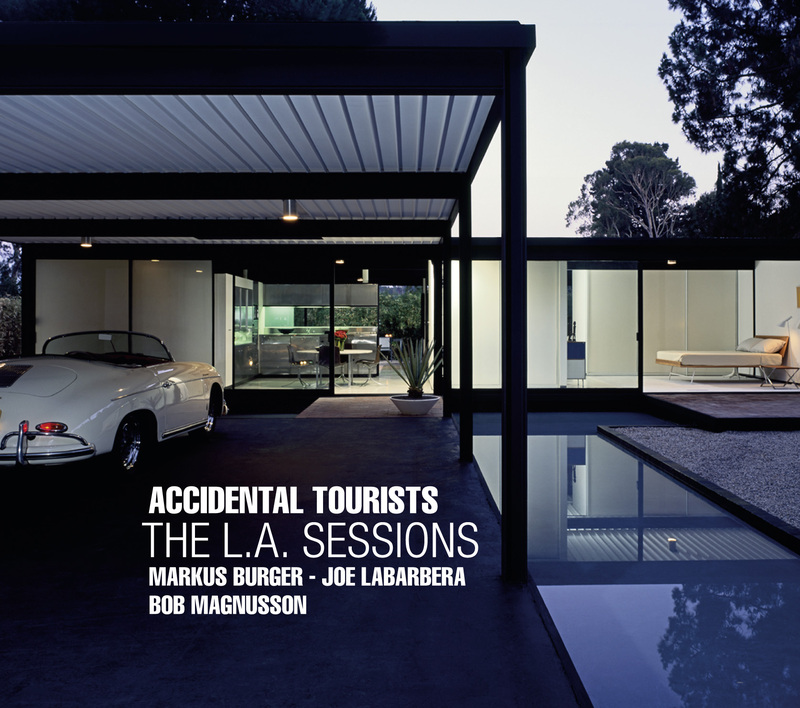 The project, Accidental Tourists-The L.A. Sessions is the first of what Burger hopes will be a series. For the album, Burger has assembled an all-star rhythm section with renowned West Coast musicians Joe LaBarbera (best known for his recordings and live performances with pianist Bill Evans and singer Tony Bennett) and bassist Bob Magnusson (known for his work with jazz greats Art Pepper, George Cables, Peter Erskine and Bobby Shew) in tandem. The album features mainly Burger’s original compositions, sprinkled with some of his most favorite standards. The opening track, Grolnicks, Burger’s tribute to Don Grolnick, showcases Magnusson’s bass and his ability to carry the rhythmic phrase forward effortlessly, with fullness and subtle elegance. “Magnusson for me has the amazing ability to anticipate your next move and support it with intelligent counterpoint”, Burger affirms. Full Circle, another of Burger’s compositions, features him doing what he does best, a signature piano improvisational style that is equal parts, poignant and inventive, with an emotive take on a sound that is reminiscent of Keith Jarrett or John Taylor during ECM’s musical apogee. The 1935 Gerschwin classic I Loves Porgy, a featured track in the album, is not only one of Burger’s favorite standards but also his personal homage to his idol and strongest musical influence, jazz legend Bill Evans, who recorded the tune in the early 1960s. “Here’s where the album comes full circle for me”, Burger says, as the track features the melodic mastery of none other than Bill Evans’ own drummer, Joe LaBarbera. LaBarbera tackles the ballad with his legendary use of wire brushes and a strong sense of time and space, all of which have come to define his musical style over the years and earn him much acclaim from the musical community at large. “Joe has that European sense of space that is part of my musical identity, but he still sticks to his American jazz roots and swings like nobody’s business”, Burger says. The album closes with the track One World, by Berlin guitarist Thomas Hopf. Burger first heard the tune while playing with Hopf back in 2002, and immediately added it to his list of favorites for its “peaceful and holistic qualities”, he says. After immersing himself in a duo project for the past decade, Burger says that working with a trio was a “refreshing experience because the communication in that setting is much wider and ideas flow in many more directions.” But refreshing barely scratches the surface. The L.A. Sessions delivers a string of captivating, rhythmically flawless and perfectly crafted gems; a must have for 2011. "The musicians play the notes effortlessly intertwine with each other: it becomes a round whole." "A winning set throughout that jaded ears will embrace." "a nicely balanced, engaging set"
"Dynamic variation and the shifting roles of soloist and accompanist continually gratify. Burger's admirable use of space lets Magnusson and LaBarbera bubble up from within the ensemble ... a great blessing to pianist and listener alike"
"The L.A. Sessions get better with each play. The interplay [drummer (Labarbera) and bassist (Magnusson)] with pianist Markus Burger is exemplary." "Brawny bass tones undergird the ensemble like strong, pliable floor joists and LaBarbera engages in exciting metric dialogue on rhythm tunes. " "... infectious, well-crafted compositions played by a stellar trio." "... an unbelievably good trio jazz album"
"Markus Burger is, like so many of today's jazz people, classically trained and it shows in his impeccable renditions of his own and other's compositions." "All in all, this is a remarkably good outing..."
"New sounds... There is nothing that excites me more than stumbling on to an artist that has taken the time to develop their own voice." ""Morning Smile" is an elegant ballad that closes the album, leaving the listener wanting more."